People will experience a mental illness in their lifetimes. Of managers reported not having training to intervene with employees showing signs of depression. Cost in USD for the 12 billion workdays lost each year to mental illness. The prevalence of mental illness poses a greater challenge to the workplace than most realize, resulting in lost productivity due to absenteeism, presenteeism, turnover and more. ALL OF THESE CHALLENGES ARE MADE WORSE BY STIGMA. Despite significant gains in awareness in recent years, mental illnesses like clinical depression or anxiety disorder are still treated far differently than physical illnesses. As a result of the confusion, isolation and lack of support created by stigma, far too many people are suffering in silence with untreated mental illnesses. WHILE MENTAL ILLNESS CAN BE TREATED, STIGMA CAN BE CURED. The StigmaZero Online Training Academy provides your workforce with the training and tools to better respond to mental illness and, ultimately, eliminate stigma. Through our innovative and comprehensive programs, your employees, leadership and HR personnel will be better prepared to minimize the impact of stigma as well as the associated costs and lost productivity. Our guided videos are not only informative, but engaging and entertaining. Learners will be provided with tools, tips and other useful resources to help them in their skill development. Our program include downloadable PDF resources which provide learners with reference tools. HR personnel will be provided with templates and guidelines for the various HR policies needed to ensure a positive company-wide response to workplace mental illness. Our lessons include thought-provoking individual activities and reflection exercises to help reinforce the concepts learned throughout. Our lessons also include group activities that can be completed with a colleague or your entire team. Our Academy offers an interactive learning experience, which is a best practice for both learning and retaining knowledge. Our programs are based on rigorous research and include extensive curated content. At the finish of the programs within The StigmaZero Online Training Academy, learners will be provided with a certificate of completion. StigmaZero aims to make this difficult topic accessible and consumable, blending stories with rigorous research in order to mobilize knowledge and perspective. Our goal is for everyone to understand this important topic so they are empowered to make a real change and ultimately join in the effort to realize StigmaZero’s vision for a future without stigma. This program was created with Pure & Applied, an education technology and learning design firm who served as principal researchers and learning designers. I would not hesitate to recommend StigmaZero and Jason to any organization that wants to raise awareness and capabilities in regards to the issue of mental health. I have seen first-hand the impact that mental illness and stigma can have on the culture of a workplace. The StigmaZero Online Training Academy offers a unique and highly effective method of dealing with these challenges head-on. 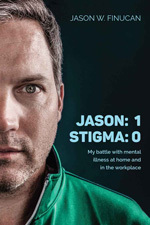 StigmaZero absolutely helps organizations manage workplace mental illness. Using compelling personal narratives, research and engaging content they offer a pragmatic set of tools for managers and employees.